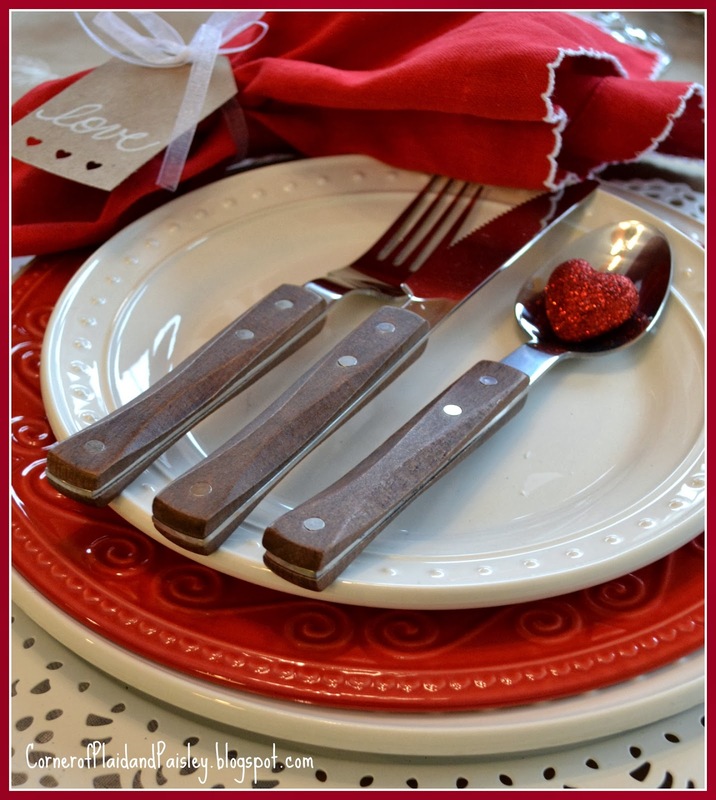 Valentine's Day - A Spoonful of Love! I'm a little early for Valentine's Day but I feel like spreading some love! 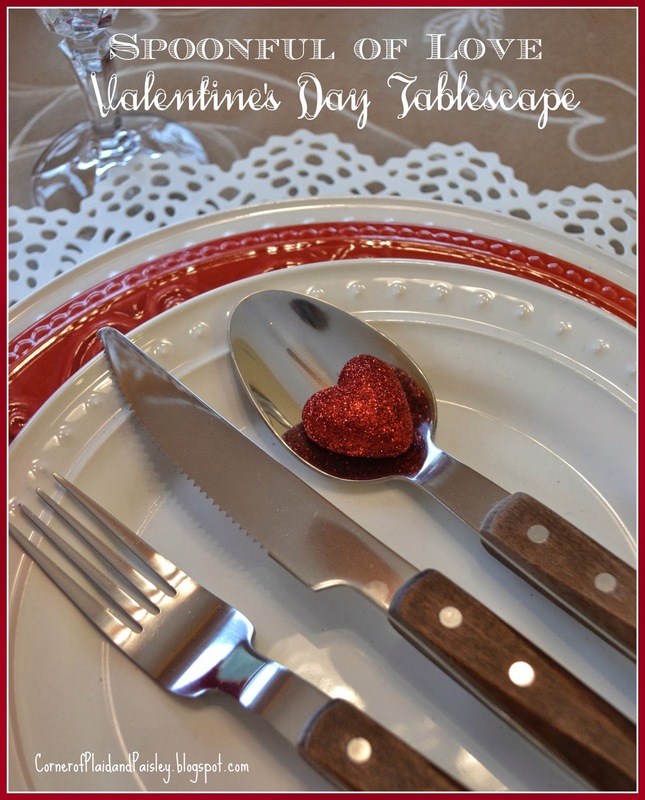 So here is a fun, casual Valentine's Table I am calling - A Spoonful of Love! Here is a look at the whole table. I did this table in my kitchen with the snow in the background, but I forgot how hard it is to photograph with all the bright light behind the table against all the windows. I wanted a casual look because I have more boys in my family and they don't really go for all the glitter and flowery stuff. But I just couldn't help putting a glitter heart in that big wood handled spoon! I started with a white table cloth topped with some Kraft paper wrapping paper. I took a paint pen and drew some vines and hearts in a kind of swirling pattern. I wanted a light centerpiece that would not cover up all of the drawing on the paper, so I chose to do some glass bottles as holders for some taper candles. 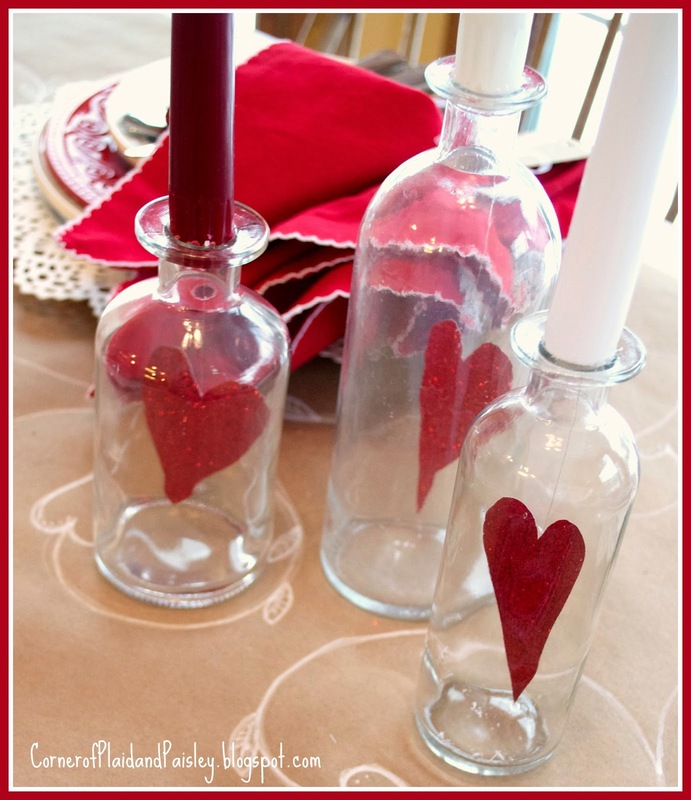 then use a pencil to kind of flatten the hearts back out once they were down in the bottle. It has been so cold all over the place, so I hope you feel some love and warmth from my table! I hope this Sparks your Valentine Plans! You are very creative, the artwork on the craft paper is really pretty! The casual look is still very romantic! I love those chargers, and the goblets are gorgeous too! Cute name - spoonful of love! Like the masculine touches on this table! Would love to pin a few of these. It that OK with you? Please Sarah!! Pin away!! There is a pin it button on the very top of my page in the right hand column!! I am thrilled that you feel it is "pin worthy"!! What a darling table! And it's chock full of great ideas! 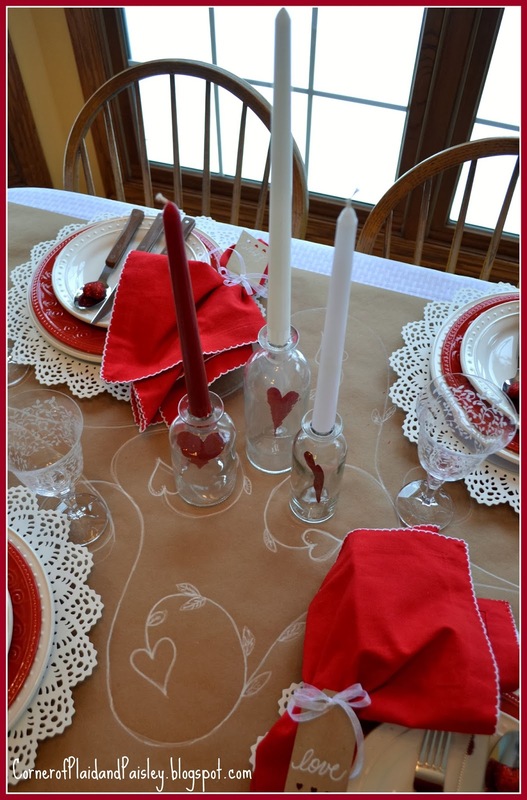 I love the "runner," as well as the hearts suspended in glass bottles used for candleholders! Super clever! Oh my gosh how cute! 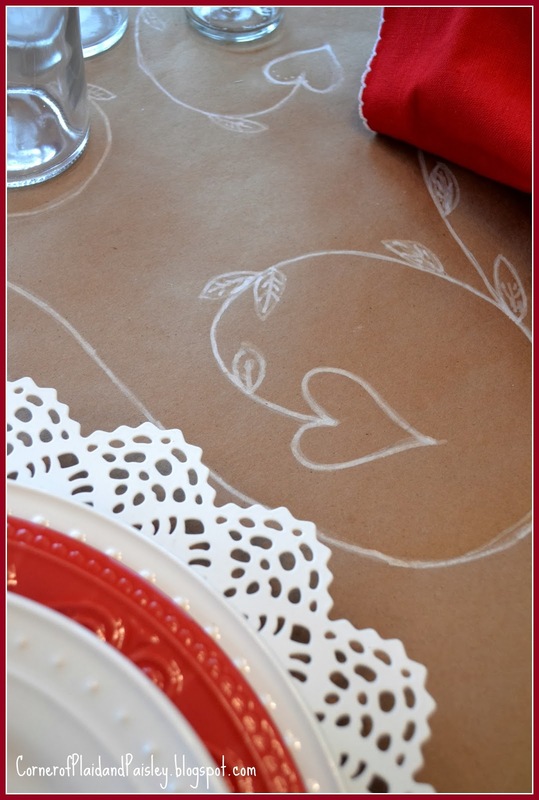 Love what you did with the craft paper- super cute idea! 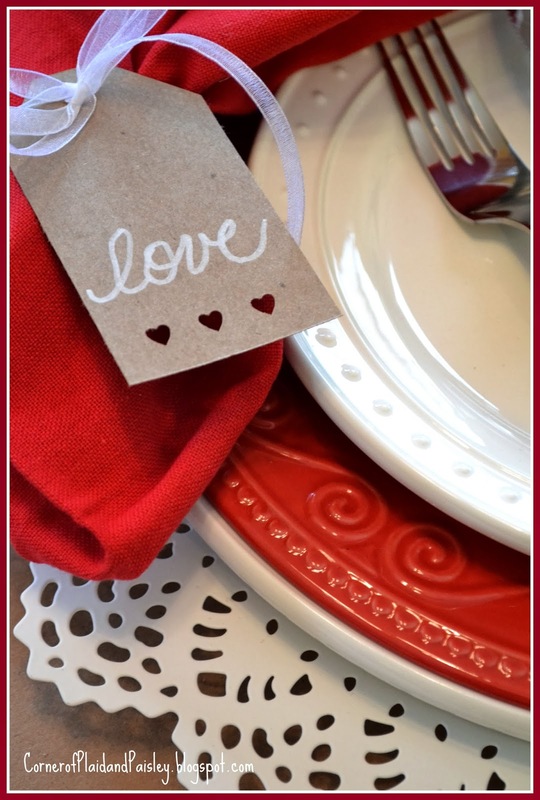 Your centerpiece idea is adorable- and I love the white chargers- they look perfect for Valentines Day! When I was in school we used to make valentines with paper doilies that we'd cut to glue onto a heart...this made me think of that! There is no doubt in my mind that you are an artist. 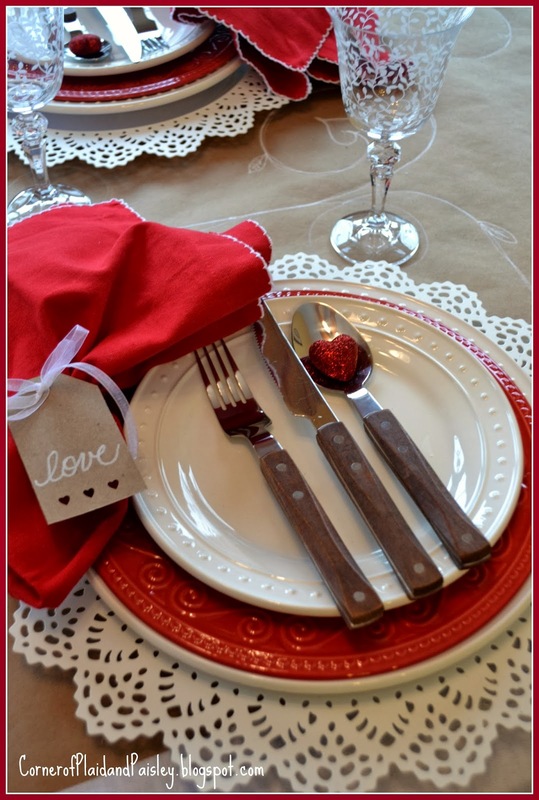 This tablescape is absolutely gorgeous in every respect for Valentines Day with your lovely family. 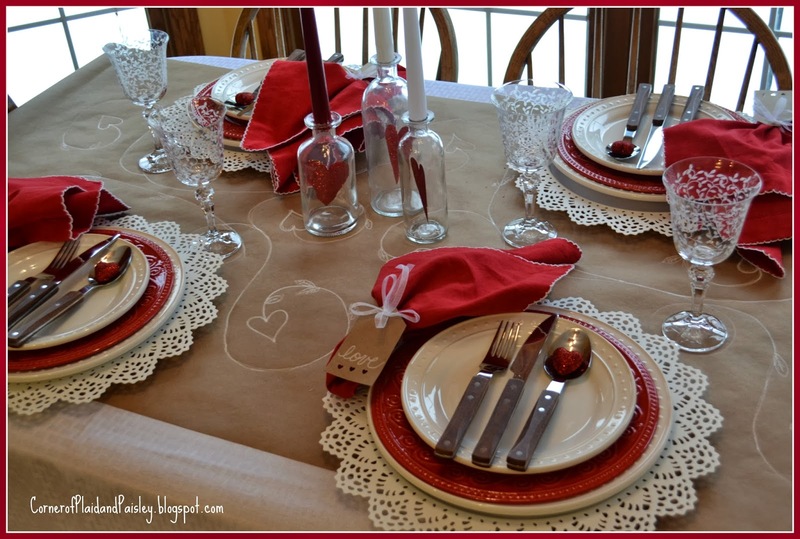 You've set a beatiful table for Valentine's with lovely dishes and I specially love the lace like placemats. You certainly are talented, I love what you did with the craft paper! Have a happy Valentine's Day with your family. Thanks for your sweet visit. Your table is just beautiful! Love the white drawing on the kraft paper. What a lovely touch! Such a clever creative and effective table. Caught my eye immediately. Love the lace chargers. So pretty. Such a cute name! I love how you used the butcher paper too...really creative! There's more than a spoonful of love on this table! Love the kraft paper. Cute, cute table, love the heart in the spoon for a spoonful of love. Smart use of your craft paper I love Valentine's Day but didn't really get to set a table this year. I'm still at my daughter's right now and haven't been back to my house. I did do something small with a red velvet cake. Take care. Oh, this is such a pretty table and I love all of the wonderful details…you are so creative! !